Participating artists : KP. Pradeep Kumar, Sumesh Kamballur, R Magesh, Sanam Narayanan, Umesh PK, Prasad KP. Palette Art Gallery presents 6 artists who explore contemporary landscapes in an exhibition Songs of the Soil. 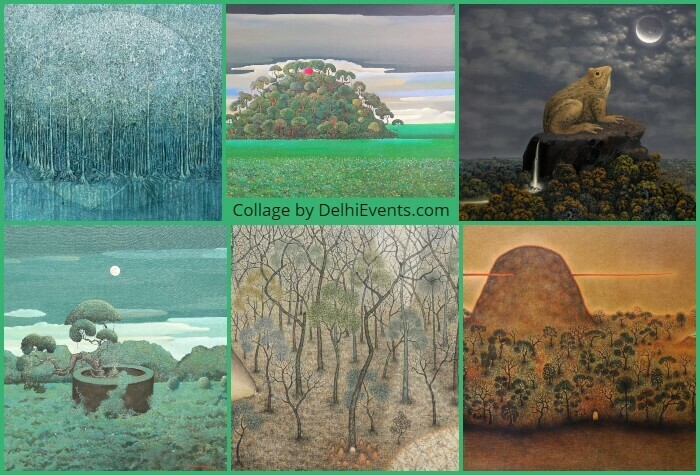 Six emerging artists give us a canvas of surrealism and an abstraction that celebrates the Southern terrain of India; these paintings are about creating new vistas, most clearly aligned with current trends. The power and intensity of a landscape in art is an attempt to reconstruct a more universal approach to notions of identity, society, refuge, and utopia. The reason why landscapes hold our attention is their power to withhold concentrated islands of human gaze as well as invite a study of understanding wherein we can be rooted to the spot like guardians of life.